Movin’ to the country, gonna eat a lot of peaches! At least I think that’s how the lyric goes. Does anyone remember ‘The Presidents of the United States of America” band? I was never really a big fan, but “Peaches” was always a good song. Mostly because peaches are awesome and they really should have their own song. I would write a song about them if I wrote songs, but thanks to the Presidents, I don’t have to. Good lookin’ out guys. Summer is the season for peaches and all stone fruit. They are at their very best right now, wearing fruit sized tuxedos and trying to charm us all with their vibrant colors and delicious tastiness. I picked up some white peaches at the farmer’s market and they were truly some of the best peaches I have ever eaten. They were organic, but still very big and had a wonderful sweet aroma….like if you closed your eyes and took a deep breath in through your nose you might find yourself on a giant floating peach full of friendly insects and some kid named James. I decided to go back to the farmer’s market and buy some more white peaches. I brought them home and had planned to make a yummy jam or something with them, but instead I ended up making Balsamic Peaches. I used a very simple recipe from Bryant Terry’s Vegan Soul Kitchen, which is easily one of my top 5 favorite vegan cookbooks of all time. You make a simple marinade of balsamic vinegar, agave and freshly squeezed orange juice (Mr. Terry is all about the freshly squeezed and it’s totes worth it). You marinate the peaches for a few minutes and then saute them in the marinade. The result is a delicious warm dessert or breakfast. Mr. Terry also suggests serving these with Cashew Cream. I took his advice and whipped some up in my good pal, the Vitamix. As a finishing touch, I sprinkled on just a little bit of cinnamon sugar. 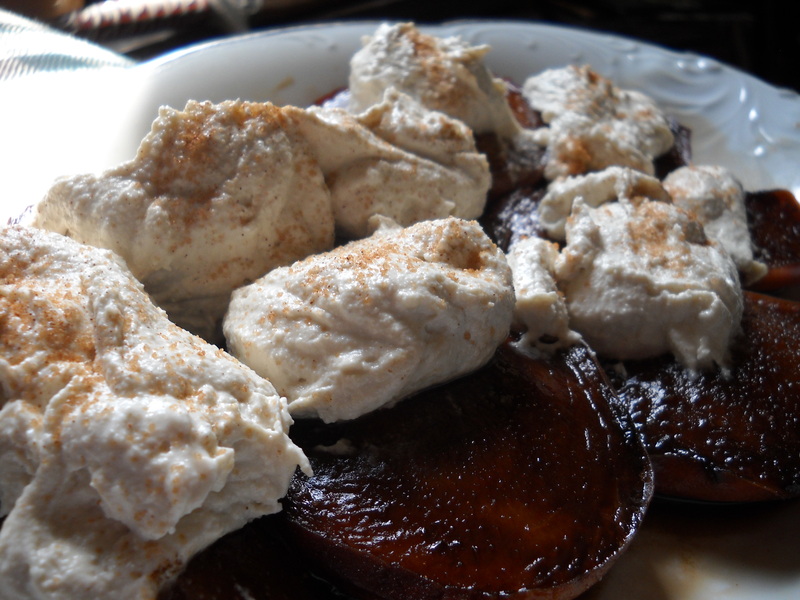 The peaches are already very sweet, and the marinade is sweet, so I didn’t want to overdo it with the cinnamon sugar. These little wonders originated in China and are considered part of the almond family. I think that’s why the pits look like almonds! The only major difference between a peach and a nectarine is that peaches are fuzzy and nectarines are smooth. You can substitute nectarines for peaches in most recipes. Peach in French, is peche! OK now I am REALLY HUNGRY! I can’t wait for our jam making adventures…. I might have some working appliances tonight. LOVED that song by PUSA as well as “Lump” (and “Gump”, Weird Al’s rendition of it). And even from someone who doesn’t normally like fruit, nectarines are so up my alley. I forgot all about Lump! That was a good song too. I don’t remember the Weird Al version, I’ma have to look that up! Here are the lyrics to that song!